When he was playing table tennis in the basement of his family's home in Gillette, University of Wyoming student Luke Hays never thought it would lead him to a national tournament in Minnesota later this semester. Hays, a UW mathematics freshman from Gillette, topped a field of eight table tennis players to capture the regional recreational tournament in Tucson, Ariz., hosted by the Association for College Unions International (ACUI). UW students competed in table tennis and billiards. UW competes in Region 13 along with colleges in Arizona, Colorado, New Mexico and Utah. This year's regional tournament featured contestants from among UW, Sheridan College, Utah State, Arizona State, University of Arizona and Colorado's Red Rocks Community College. With his win, Hays advances to the national ACUI tournament at Rochester Technical College in Rochester, Minn. The Wyoming Union hosted a campus-wide qualifying event late in fall semester for both men and women in 9-ball billiards and table tennis. The winners advanced to the regional tournament. Hays defeated his four opponents in a round-robin style of play at the regional tournament, in matches that go to the player who reaches 11 points. Players must win by at least two points. Hays says he started playing just for fun as a youngster in the family's basement, and it was his dad, David, who helped him with the finer points of the game. "My dad was a really good player. He taught me how to play the game, using different shots, spins, serves -- all the fun stuff," he says. "I started out just playing for fun and I've never really stopped playing." 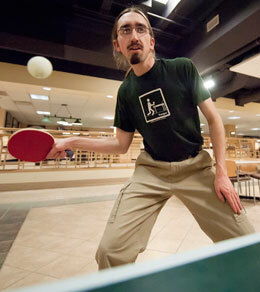 He plays twice a week on the Wyoming Union tables and is a member of the UW student table tennis club. Hays looks forward to competing at next month's national ACUI tournament and already has his strategy in place for each match. "I try to determine what my opponent's weakness is. I try to not give him a chance to start out what he is the strongest at -- whether his serve or return is to the left or right side," he says. "I try to dictate where the ball goes -- to the weak side. That's where I put my shots." Three other UW students competed in the table tennis and billiards regional tournament. Erika Leininger, Casper, was the only female competitor and played in the men's table tennis bracket. Jamie Magrum, Mills, finished third in the women's 9-ball tournament, while Scott Maloney, Duxbury, Mass., placed fourth in the men's 9-ball competition. He is an alternate for the national tournament at Virginia Tech, Blacksburg, Va.